Astronomers have used NASA’s Chandra X-ray Observatory to discover the first pair of supermassive black holes in a spiral galaxy similar to the Milky Way. At a distance of 160 million light years, it is also the nearest known pair of supermassive black holes. The black holes are located near the center of the spiral galaxy NGC 3393. Separated by only 490 light years, the black holes are likely the remnant of a merger of two galaxies of unequal mass a billion or more years ago. dynamic the auroral oval is. “The bottom line is that if life is out there, the high-tech tools of chemistry will find it sooner or later,” said Jeffrey Bada, Ph.D., co-organizer of a special two-day symposium on the Red Planet, which began here today during the 242nd National Meeting & Exposition of the American Chemical Society (ACS). “It certainly is starting to look like there may be something alive out there somewhere, with Mars being the most accessible place to search,” Bada added. Senior managers representing 10 space agencies from around the world met in Kyoto, Japan today to advance the Global Exploration Roadmap for coordinated space exploration. On its way to the biggest planet in the solar system — Jupiter, NASA’s Juno spacecraft took time to capture its home planet and its natural satellite — the moon. Stars aren’t shy about sending out birth announcements. They fire off energetic jets of glowing gas travelling at supersonic speeds in opposite directions through space. 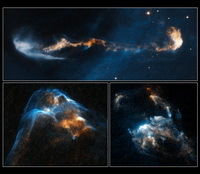 Although astronomers have looked at still pictures of stellar jets for decades, now they can watch movies, thanks to the NASA/ESA Hubble Space Telescope. NASA has established an astrophysics technology fellowship named for the woman many credit as one of the key contributors in the creation of the Hubble Space Telescope.